Dear all, it has been some time. I want to warmheartedly thank Prof. Panayotis Papazoglou (http://papazoglou.edu.gr) for the hospitality. He made a great effort in making for the second consecutive time the ROBO meeting a success! In our case, these automata comprise of a two-dimensional matrix composed of identical cells, the internal state of which can be visualized by assigning it to pixels of a display through a palette of 256 colors. Calculate the sum of the values for the 8 neighbors (Moore neighborhood) of a given cell C.
Following these simple steps for every cell, the digital kaleidoscope presents an explosive, chaotic and at the same time, highly interesting behavior. For the implementation, I followed a number of specific steps. First, a software-based, host-running implementation was examined. I coded this in plain ANSI C, and used it to produce PPM snapshots for each generation of the automaton. Then using gifsicle, I had these PPMs converted to nice-looking animated GIFs. These would allow me very early in the development cycle to have a grasp of how the hardware demo would potentionally look. * Decode the RGB encoding of the specified color. * Generic implementation of the rug rule automaton. // Calculate next grid state. // Increment cs, modulo 256. // Copy back current generation. * Print usage instructions for the "rugca" program. This block will then be incorporated in a given system I have developed for image and video synthesis demonstrations. This happens naturally in a plug-and-play way. Meaning that for custom procedural image/video generation, this system needs only be updated by the specific finite-state machine with datapath (FSMD) with proper streaming outputs for the purpose. HercuLeS now is ready to rumble. Within a few tens of seconds, the VHDL code for the block is generated. Remember that “humans were not involved in the process :)”. So let’s see what we can do with this automatically-generated code. First, let’s see how does it look like. Wowa! That’s a lot of stuff that went on in HercuLeS. It seems that it did the work. A self-checking testbench was also automatically generated by HercuLeS but we will not focus on that in this particular blog post. Technically, this is a single FSMD with separate processes for current state logic and next-state/output logic. Datapath actions are embedded within the next-state/output logic process, no messy code with concurrent assignments (has its pros and cons). Overall, the code closely follows the FSMD paradigm as presented in Prof. D. Gajski works (http://www.cecs.uci.edu/~gajski/) and how this scheme was presented in Prof. Pong P. Chu’s books: http://academic.csuohio.edu/chu_p/ (I own two of them). The automatically-generated implementation uses a kind of triple-buffering. We need a working and a temporary memory for the automaton world, representing generations n and n+1. In the hardware-oriented version, it is of size 80×60, using 8×8 upscaling, due to the limits of the available internal RAM of the FPGA device (block RAM), which is around 360 kbits (we will use around 70% of this). For better visual output, and since we will run computations within the video on timings, we use a separate, third memory, as a video frame buffer. Of course, improvements are possible against this scheme, e.g. by using line buffers are doing all computations within the blanking interval durations. It will also be interesting to port this demo to another board using fast, zero-cycle turnaround SRAM. I had a great time with the exhibition, moving away from remote customer interaction (and their virtual whiplashes and meeting a lot of people in person, including school children, parents, technology afficionados, higher education students, hobbyists, local industry, teachers and professors. This is what my demo looked like (so it is true hardware, no hidden computers running the show, I had to point this out a lot). It appears I was a little tired, but hey this was towards the end of the day (and I needed refueling). 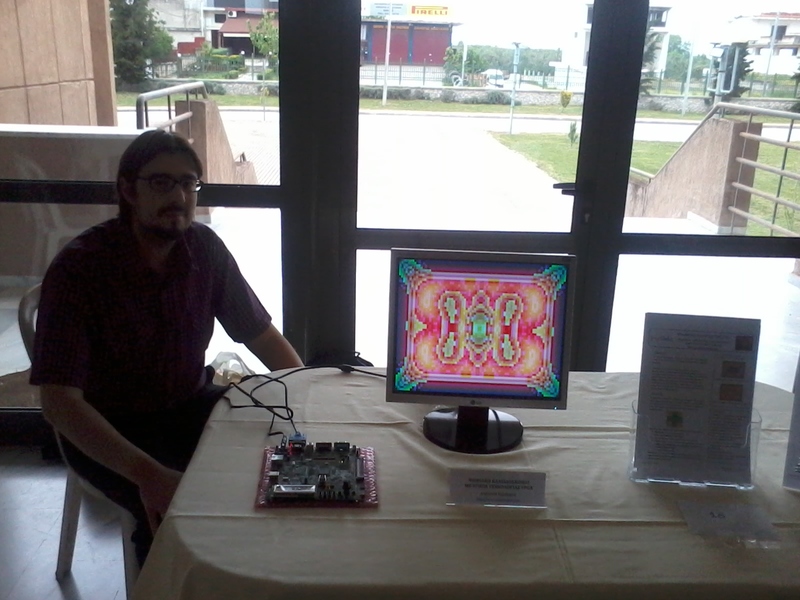 The hardware is using a delay loop in order to let humans visualize the process. The increment parameter of the automaton is controlled by the four slide switches available on the specific Digilent board and we can set any value from 0 to 15. The digital circuit was designed in the VHDL hardware description language. To dramatically reduce design time, the behavior of the circuit was first described in the C programming language. The C program was automatically translated to VHDL using the HercuLeS high-level synthesis tool. The resulting description was then synthesized on an FPGA integrated circuit (Xilinx XC3S700AN) using the Xilinx ISE/XST logic synthesis environment. The development board which has been used is the Xilinx Spartan-3AN Starter Kit by Digilent. Folks, I hope you have enjoyed this short (or long) walkthrough through the lost artland of Kaveirian (that’s me) high-level synthesis. My next steps would involve pretty much everything, after all HercuLeS is used for day-by-day, real-life, commercial-grade work; most frequently for work intended for clients (that most times cannot be disclosed). So I am thinking of a more impressive set of demos, like an algorithmically-generated 3D world which you can explore via a simple keyboard interface, 3D graphics demos (all done in plain hardware), chess engines, obscure IOCCC entries, etc. I am always collecting ideas across the web, especially “mini-codes” or “tiny-codes” that could be turned into interesting hardware demos. 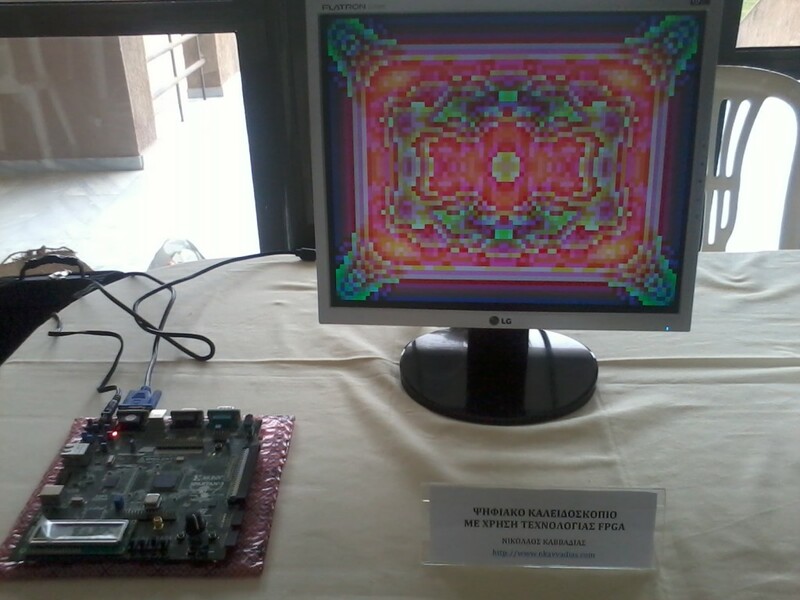 This entry was posted in FPGA, High-level synthesis and tagged cellular automata, FPGA, high-level synthesis, HLS, VHDL on May 16, 2014 by j9395nkavv.